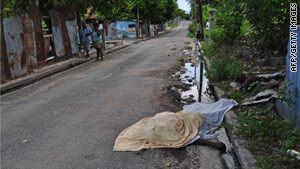 A body lies in the streets in the Trench Town neighborhood of Kingston, Jamaica, this week. Kingston, Jamaica (CNN) -- An Organization for American States body expressed "deep concern" Thursday over the violence engulfing the Caribbean nation of Jamaica and wants an inquiry into the unrest that has left at least 67 dead. The Inter-American Commission on Human Rights said it "deeply regrets the deaths that have occurred in this context, and urgently calls on the State of Jamaica to conduct a diligent, effective, and impartial investigation of these events." The attempt to arrest Christopher "Dudus" Coke, a suspected drug kingpin in the Jamaican capital of Kingston, has resulted in the arrests of more than 500 people and the confiscation of firearms and ammunition. In the Kingston neighborhoods of Tivoli Gardens and Denham Town, street battles raged between security forces and Coke's supporters, and the violence has unnerved the area. Deputy Police Commissioner Glenmore Hinds said 73 bodies have been recovered, but six of them might have died in unrelated incidents. He said Coke has not been arrested. The government said it is making arrangements for news reporters to enter the conflict zone, and it issued comments from business leaders backing the security operation because it could bring down crime. The OAS commission, meanwhile, has "requested urgent information" from Jamaica on the deaths and measures it is taking to "minimize the loss of life" and investigate the situation. It has raised concerns about "the legitimate use of force" used by security forces. "Case law of the Inter-American System of Human Rights has made it clear that agents of the State have the obligation to enforce the law and maintain order even when the process involves, in some cases, death or bodily injury as a result of the proportional use of force. "Furthermore, the force used must not be excessive. When excessive force is used, personal integrity is not respected, and all loss of life that results is arbitrary. The IACHR urges the State of Jamaica to adopt all necessary measures to guarantee the right to life, integrity, and security of all persons." It also said that the state of emergency declared in Kingston should be "commensurate to the situation and should not involve any type of discrimination" and "conducted in a manner that conforms to Jamaica's obligations under the American Convention on Human Rights." Coke -- who has a heroic reputation in Kingston's slums -- has been likened to Robin Hood and Jesus because he has helped the community by handing out food, sending children to school and building medical centers. But drug enforcement officials say he deserves to be classified as one of the world's most dangerous drug lords. He was charged last year in U.S. federal court with conspiracy to distribute marijuana and cocaine and with conspiracy to illegally traffic in firearms. The U.S. attorney's office in New York, which accused him of leading an international criminal syndicate known as the "Shower Posse," has asked for his extradition.